Two names explain Prime Minister Shinzo Abe's current tour of South East Asia: Rodrigo Duterte and Donald Trump. 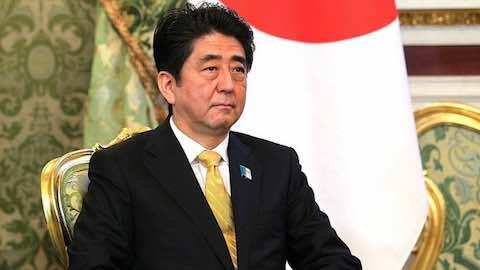 Just a year ago, things were, as the British would put it,"going swimmingly" for Abe. He had rammed through his unilateral interpretation that"collective defense," which would involve Japan in military operations with allies outside its home territory, did not violate Article 9 of the Japanese constitution. He had faced down domestic opposition to Japan's participation in the regional free trade arrangement called the Trans-Pacific Partnership (TPP). In both enterprises, Japan had acted, in the traditional fashion, as Washington's junior partner. Collective defense was Japan's contribution to President Obama's vaunted strategic reorientation that came under the rubric"Pacific Pivot." The TPP was the geoeconomic counterpart of the pivot, with the world's biggest national economy teaming up with its third biggest, to contain the second biggest, China. Then, in mid-year, the regional design that Washington and Tokyo had painstakingly patched together began to come apart, totally unexpectedly. Shortly after assuming office, Philippine President Rodrigo Duterte went on a surprising, unprecedented offensive against Washington, culminating in an October visit to Beijing, where he declared"independence" from the United States and waxed melodramatic about"the Philippines, China, and Russia against the world." Since the Philippines functioned as the"southern anchor" of the U.S. military presence in the Western Pacific, of which Japan was the"northern anchor," Abe was alarmed. The strategic implications for Japan of a breakaway Philippines was what led to Abe's invitation to Duterte to make Tokyo the site of his first state visit outside the Association of Southeast Asian Nations (ASEAN). Beijing brusquely cut in, however, and Duterte, recognizing the regional power hierarchy, went to China instead. After the Duterte surprise came the Trump shock. During the U.S. presidential campaign, Trump seemed to point in the direction of a more isolationist United States. Where Japan figured in Trump's speeches, it was mainly as a country that enjoyed U.S. protection without paying for it. Once he got elected, he promised, he would collect protection money from Tokyo and other allies. Trump's isolationism was more pronounced on the economic front. He denounced the TPP that Obama and Abe had so painstakingly promoted as contrary to U.S. interests and spoke about retaliatory tariffs against"unfair traders." Tokyo took Trump's campaign statements to mean that he would erect a tariff wall around the United States that would screen out cheap imports in the same way that his planned Wall on the Rio Grande would keep out Mexican migrants. They were confirmed in their suspicions recently when, just as Abe set out on his Southeast Asia tour, President-elect Trump tweeted that he would impose a"big border tax" on Toyota if the Japanese carmaker went ahead with plans to build an assembly plant in Mexico to produce cars to export to the United States. To Tokyo, old certainties that underpinned the post-World War II order were suddenly melting, and rapidly. The linchpin of this power structure was what the historian James MacDonald described as the great"unspoken bargain." That is,"the United States would exercise a near monopoly of force. However, it would use its force not to gain exclusive economic advantages, but as an impartial protector of Western interests." Japan was part of the Western bloc that benefited from U.S. military protection and U.S.-supported global free trade. However, as a defeated power in World War II, it settled into the role of a semi-sovereign state, whose basic strategic and foreign policy choices were made in Washington. With the future of the ancien regime suddenly in question, Abe has felt compelled to become a more proactive partner in the US-Japan alliance. Commentators in Japan think that he accomplished his main mission in Manila, which was to get President Duterte to officially state the importance of his country's alliance with the United States. That concession is not, however, going to get in the way of Duterte forging closer ties with Beijing or with Moscow, which sent a destroyer on a goodwill visit to Manila a week before Abe's arrival. Equally important is the economic part of Abe's mission, which is to ascertain whether there remains interest in resuscitating the TPP even if the United States withdraws from it, which Trump announced as one of his priorities upon assuming office. Two of the countries he is visiting, Australia and Vietnam, are members of the TPP, while Indonesian President Jokowi had expressed interest in joining the body before Trump's electoral triumph. Abe's trip is taking place under the shadow of China, whose maritime claims in the Western Pacific worry Tokyo and whose economic clout now outweighs that of Japan, which has not really recovered from 25 years of stagnation. On both military and economic fronts, it will not be easy to convince Southeast Asia to support his strategy of containing China if the United States is not seen as solidly behind it. It's all so bewilderingly new for Tokyo. A man of the right, Abe has always stated that his mission was to make Japan a full-fledged sovereign state, free of the vestiges of wartime defeat, like Article 9 of the Japanese constitution, which banned war as an instrument of Japanese foreign policy. Moving away from the U.S. alliance was not, however, one of his priorities. Rather, his strategy has been to use the alliance with the United States to rearm Japan and enable its military to play a greater regional role in containing China, which is the key aim of Japan's grand strategy. Now, suddenly, owing to the unpredictable nature of democratic politics in its key allies, Abe and the Japanese elite are being forced to confront fundamental issues that had long been decided by Washington: Tokyo's relationships with China, Korea, Russia, and Southeast Asia. For Japan's elite, it was humiliating to be a semi-sovereign state. But it had its benefits. Among them was Japan's being able to become an economic superpower in the four decades since the end of the war, partly because it invested very little in defense. And it was comfortable. When things went right, like the U.S.-China rapprochement in the 1970s, Japan could share in the benefits. When things went wrong, like the war in Vietnam, Washington was there to blame, even as Japanese businesses made money from the war. The Japanese are beginning to realize that being fully sovereign means dealing with headaches for which someone else had to take prime responsibility for over 70 years. And the biggest challenge of all, with the United States under Trump slouching towards isolationism, is the future status of Washington's principal ally in Asia. Will Japan be reduced to an isolated offshore state in the post-post-World War II Asian order? Foreign Policy In Focus columnist Walden Bello made the only recorded resignation out of principle in the history of the Philippine Congress in 2015, owing to what he saw as the Aquino administration's double standards in dealing with corruption, failure to deliver economic and social reform, and subservience to the United States. An anti-dictatorship activist, he was principal author of Development Debacle: The World Bank in the Philippines, which exposed the Marcos-World Bank alliance in forging the export-oriented capitalist development model. A retired professor of sociology at the University of the Philippines, he is currently senior research fellow at Kyoto University and professor of sociology at the State University of New York at Binghamton. This article is an abbreviated adaptation of a much longer piece for the Philippine Sociological Review. "Will Japan Stand in Splendid Isolation?"